Easy and Simple way to Deal with Low Lighting Conditions! The Softbox lighting Kit offered by 123 video magic help the photographers to click natural-looking pictures without any hassle. The softbox lighting equipments help the photographers to diffuse the harsh light falling on the object which results in more even and natural shoots. 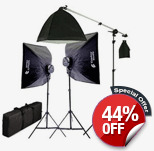 The softbox light kit is durable, versatile and easy to operate. Add it to your photo studio collection now! The kit offers complete value for money.